Dusty Arena Or Barn Aisle? Be Careful! Most riders and horse owners have experienced dusty barns and riding arenas at some point. A thick dust cloud is kicked up and than the coughing begins. The weather isn’t always to blame, but dry, summer days don’t help the situation. What’s more, these sand and dirt particles could seriously affect your horse’s health. It’s time to rid the dust! Horses can experience mild to severe allergies from exposure to dusty barn aisles or riding arenas. This can include irritated eyes and runny, congested noses. Your horse may even develop a cough or start sneezing. In more severe cases, a respiratory allergy known as heaves may be experienced. The air passages will swell and make it difficult for the horse to inhale and exhale. This very serious condition can also be from dusty bedding or hay. Even if milder allergies surface you should expect decreased performance from your horse. He may appear sluggish, moody, and uncomfortable. Simple things such as sweeping and raking the aisles when the horses are out can help. Some horses may need their hay soaked or pellet bedding. May barns will water their arenas and even aisles with the hose once a day in the spring and summer. Do not make it too wet or the surface can become slick. While water and possibly a sprinkling system will be the cheapest approach, those looking for other ideas may try salt, oil, or rubber. Salt can be added to the surface and worked in over time. It is a great additive when the weather is too cold for water. Oils, like vegetable oil, coat the surface and bind to the dust. And rubber can be mixed in with sand to reduce dust clouds. May people experience the same uncomfortableness that their horses do when exposed to thick dust. For the safety of your horse and even you it is wise to develop a system to combat dusty arenas and barns. 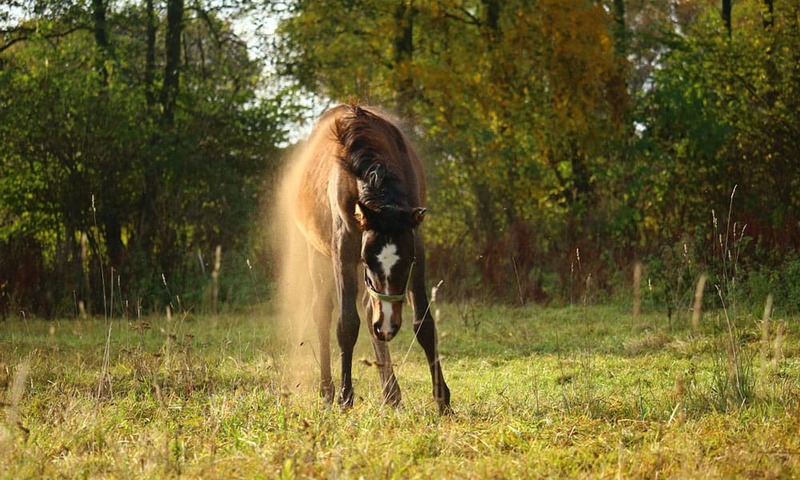 Recognize the signs of a horse experiencing dust allergies and get prepared!